Summer is here, in the northern hemisphere, but these two characters, Olive and Moonee, are on film to provide sunshine all year round. With dysfunction all around them, they move full steam ahead with their innocence and shiny optimism. 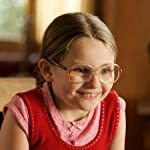 Olive is the protagonist from 'Little Miss Sunshine,' and Moonee, the heroine of 'The Florida Project,' lives in the official "sunshine state" and if any child could embody that banner for the state, it would be her. Which of these unstoppable, brave, and sweet little girls do you think spreads the most sunshine to cinema?